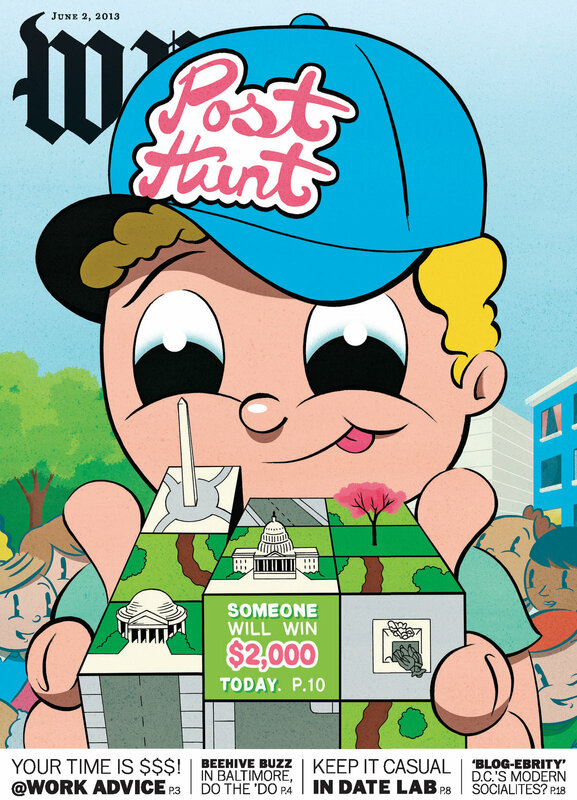 Your online guide to the zaniness of the 2013 Post Hunt! 1. In which of the following sentences is the word "Pyongyang" used correctly? A. The dogmade Pyongyang on the carpet. B. Doctors removed an entire set of ovenware from the victim�s Pyongyang. C. Pyongyang is located on the Taedong River. D. "In time for the 4:30 staff meeting." E. "Because there is no tunnel through the mountain." 3. Which of the following is not the age of a player on the New York Yankees 2013 roster? 4. Anthony Weiner wants to run for mayor of New York. If you were his campaign manager, which campaign slogan would be a bad idea? A. Weiner: The Candidate Who Really Sticks Out! A. Weiner Will Work Hard For You! A. Weiner: He�s the Whole Package! A. We�ve Got Your Weiner Right Here! 5. According to the Social Security database, which of these names was given least frequently to baby girls in 2011? Bachelor No. 1 had written "Meyer." Bachelor No. 2 had written "Boney Ed"
Bachelor No. 3 just marked a big X, as though he were illiterate. The bachelorette asked a series of questions, but all any of the three ever answered was a piratey, "Arrrrr." In the end, the bachelorette chose 4 as her winner, writing it on an easel to the right of all the pirates. Photo - The Pirate Dating Game is on! Photo - The bachelorette makes her pick�of none of the pirates! "The purpose of this eye patch is concealment. Let no EYE go uncovered." Astute Hunters read that to mean that they should eliminate all the occurrences of the letter sequences of E-Y-E in the bachelor names. Deleting the e-y-e in Meyer, Boney Ed and X, left them with, "Mr. Bond X." The bachelorette, hating all three of the bachelors, instead selected the nonexistent bachelor number 4, and wrote "4" after X. Now Hunters who used the R eye patch instruction had Mr. Bond X 4. Which is 007 times 4. At one puzzle site volunteers handed out hard candy squares flavored to taste like root beer. On the map, the puzzle site was also marked with a candy bar. In the Hunt issue of the magazine was a fake ad for a tavern-restaurant called the Candy Bar. The ad said that the bar featured 289 beer varieties. Hunters had to figure out that the hard candy was a hint - a square that tasted like root bear, or SQUARE ROOT BEER. All those brilliant Hunters who took the square root of the number of beer varieties came up with 17, the solution for this puzzle. Volunteers directed Hunters through an opening marked with a sign that said EXIT, then past a stage with an actor performing short soliloquies, then finally out through an opening marked ENTRANCE. The actor�s speeches all sound odd, ie: "Country your for do can. You what ask you for. Do can country your what not ask?" In other words, everything is BACKWARD, including the famous JFK speech line, "Ask not what your country can do for you." As Hunters left through the door marked "entrance," they were handed a program. It had a bunch of blather on the front, and on the back, a trademark, as if from the paper manufacturer or printer. The paper manufacturer's name on the back was "Owty T. Newt." Hunters who realized that they need to read the "back words" on the program backward, transformed Owty T. Newt into twenty-two, the solution to this puzzle. In McPherson Square, an odd wooden device was being used to cruelly detain a dummy by clamping around the dummy�s ankles and wrists. Every few minutes, the dummy was hauled up a tall gantry, then release to freefall to the ground with a speaker playing a loud crash noise. History students recognized this device from the colonial period, called stocks. This obviously represented when the stock market crashed. The solution to this puzzle was 1929, the year of the famous stock market crash. Someone dressed as a giant thermometer. A woman in white with no arms visible. A man dressed as a Roman soldier. A man in golf clothes wearing a yarmulke and sidelocks knocking a golf ball with a putter and shouting "Oy vey!" in frustration each time he putted. Someone wearing enormous plastic buttocks. Someone wearing flippers, carrying a trident and wearing a crown on their head. Hunters who got this one realized these actors represented the solar system. The one in the middle of the stage in yellow was the sun. The thermometer was mercury; the woman with no arms, Venus; the Roman soldier, Mars; the man in the yarmulke was Jupiter (a "Jew putter"); the hula-hooper was Saturn; the buttocks man Uranus. The flipper man was Neptune. What�s missing is the Earth. Alert Hunters found our planet on the Hunt Map in the magazine,in the guise of a globe, with the number 24 on it. But 24 was not a possible answer. Hunters had to go to that location, where they discovered a sign that said +192. The solution to this puzzle was 24+192, or 216. No clues available for this year. At 3 pm, Gene Weingarten announced that the sixth and final clue would be what happened on the stage in the next minute. A minute went by and nothing happened on the stage. 1. The final clue begins at three-oh-one. That�s what us pirates call treasure. And Y marks the start." "Go west until you meet a sweet lady." "Turn left, walk until you reach green mountains." "Follow mountains southwest; go to distinguished pole." "Look giant bird in eye, flap your arms." These are clearly a set of directions telling Hunters where to go and what to do to win. But one thing is left out: a starting point. That�s why the pirate�s message also says: "Y marks the start." The Y eye patch instruction is: "Dummy!" This told those few Hunters still in the Hunt that they should begin at the point where they saw a dummy, modeling the stocks in the Stocks Crash puzzle. Beginning from there, and following the directions above, brought Hunters from McPherson Park, where the dummy was, across 15th Street to the Georgia Brown restaurant ("a sweet lady" as in Sweet Georgia Brown). From there they were told to turn left, until they reached green mountains - Vermont Avenue. (Vermont is the Green Mountain State.) Now it was just a question of following Vermont southwest to a "distinguished pole." That turned out to be the statue of Polish patriot General Thaddeus Kosciuszko, which stands where Vermont hits Lafayette Park. At the foot of the Pole was a large bronze eagle. It was this "giant bird" the winning Hunters had to look in the eye when they flapped their arms like wings, and became the Hunt�s winners. Photo - The solo winner of first place�Sean Memon! CLICK HERE TO BROWSE PHOTOS FOR 2013! Photo - Welcome to the Post Hunt! Photo - At the Post Hunt, you can see a flying balloon octopus!